It never made sense to me that most of the Greek restaurants in Midtown are ultra expensive and cater to the expense accounts or splurging tourists. We’ve certainly not been lacking for souvlakis and gyros from trucks and carts (Uncle Gussy’s, Carnegie John’s, Lil Zeus Lunch Box, just to name a few). But sometimes it’s nice to sit down with your tzatziki. The two-time Vendy Award winning truck Souvlaki GR put up a sign a few months ago announcing they would be opening a second brick-and-mortar location on 56th Street between 6th and 7th Avenue. We recently received a tip from Luncher Anna that the restaurant is now open and worth checking out. 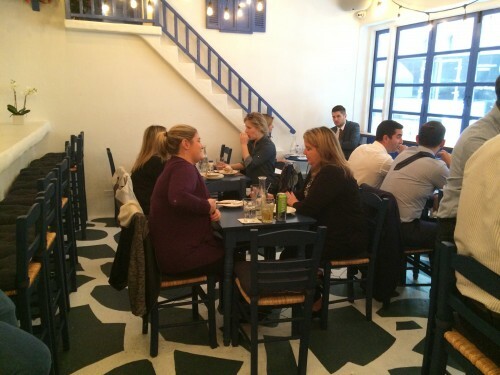 Just like their Lower East Side location, stepping into the small space is like walking into a taverna in Mykonos. It’s beautiful and truly transportive. I didn’t have time to sit down and eat, but I was pleased to see there were a few tables available on a Friday around 1:00. 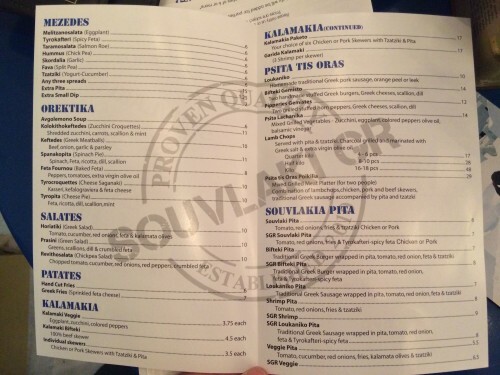 While I waited for my takeout souvlaki, I perused the menu which was surprisingly affordable and varied. I’ve had the chicken pitas at the truck many times and am a huge fan, so it was difficult for me to try anything else. But I might have to come back for dinner to splurge on those lamb chops and some loukaniko. I also wanted to try the chicken pita to see how it compares to the one I’m used to on the truck. It was about the same size, which is not huge. 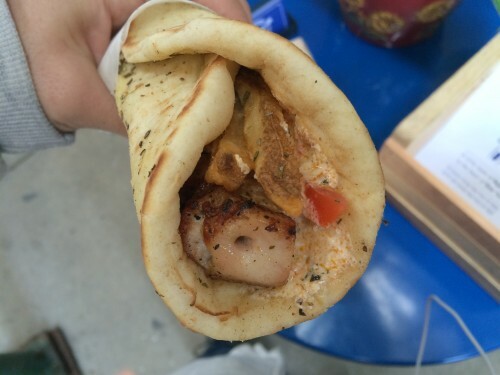 But the pita is wrapped tightly and holds some big flavors and a fair amount of food. 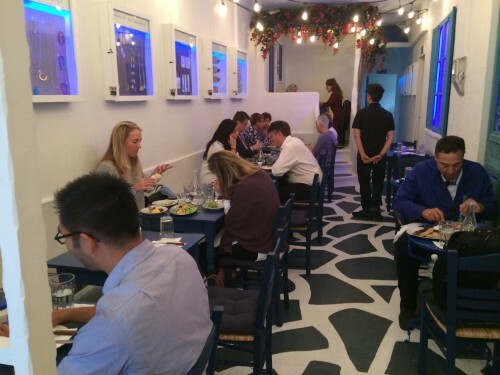 The pita itself is utter perfection – one of the best I’ve ever had in Manhattan. It’s soft, fluffy, with a hint of Greek salt and olive oil. I also chose the spicy feta spread called tyrokafteri to pair with tomatoes, handcut fries, and some cubed chicken. As always, the chicken is soft and tender with lots of charred notes. I always hope for a bit more food, but I think $7 is a fair price, especially if you’re going to sit in. 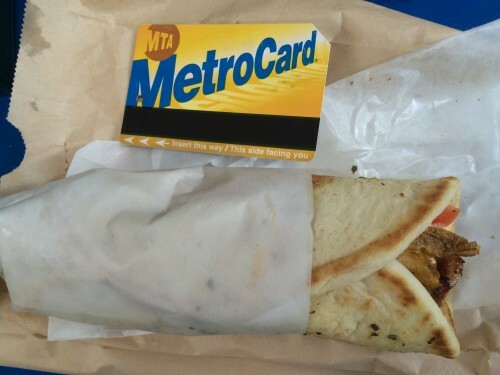 But as we know, we can get cheaper and larger souvlaki at some nearby carts. 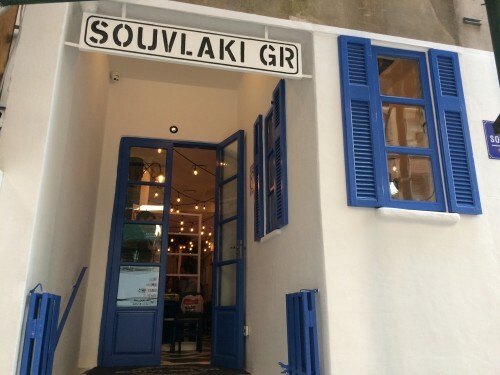 That being said, the food and ambiance at Souvlaki GR are definitely worth checking out. And it’s a huge win for this part of Midtown. Posted by brianhoffman at 11:49 am, October 21st, 2015 under Souvlaki Truck GR. I tried the pork souvlaki there a couple weeks ago. It wasn’t bad. There is definitely a movement to get more authentic greek food into NYC and these guys are part of it. So is Amali Mou at Urbanspace. The decor of the store is like a blast into Greece. Even the electrical box is authentically greek. The decor alone makes this place worth a visit.